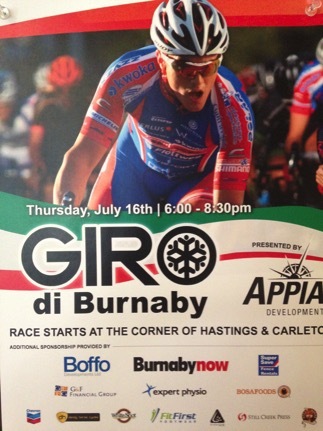 The fast paced pro-cycling Giro di Burnaby is hitting the streets of Burnaby on July 16th this year. The Giro di Burnaby is a criterium race, it is a spectator-friendly, action-packed bicycle road race. It rarely lasts more than 90 minutes and consists of many laps on a course no longer than 2km. The race happens on Hastings Street between Madison Avenue and MacDonald Avenue. The stage is on the south-side of Hastings Street at Carlton Avenue. View this high intensity, high speed race from a corner to see over 100 riders lean their bikes into a sharp turn or at the start/finish line. If you have a massage therapy appointment at the Capitol Hill Massage Therapy Clinic you should make note of the temporary road closures and parking restrictions.